The two Santa Barbara men who went missing last Sunday in the desert near the border of San Bernardino and Kern counties have been found dead, according to sources close to the victims’ families. Search and rescue teams on Thursday afternoon discovered the bodies of Chris Rice, 29, and Dan Carbonaro, 27, a mile-and-a-half southwest from Randsburg in the area of Government Peak. 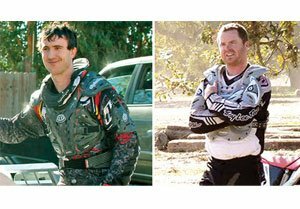 They had set out from the small town at around 2:30 a.m. Sunday morning on a two-seater all-terrain vehicle and were reportedly headed southeast for Cuddeback Dry Lake in San Bernardino County, although their wreckage was located on the opposite side of town. Their bodies were found 400 feet below the cliff that they drove off; their ATV was another 100 feet down. Sources say the accident occurred the night Rice and Carbonaro left the Cottage Inn in Randsburg. While Kern County and Santa Barbara authorities declined to offer official comment on the discovery, the information that The Independent received from outside sources was confirmed by one of our staff members who knows one of the deceased men and has been in constant contact with family members involved in the now-ended search. – Two bodies found about noon today…The ATV went over a cliff and dropped 500 feet. The Bodies are being airlifted now. Found about 1.5 miles from command post. – The location is Government Peak. I am searching for that now! – I report this with great sadness and held back until I was able to reconfirm that the family’s were notified of the situation. – I am saddened to no end to have to have been the one to report this information. – I understand it was a team from Ventura that made the discovery. An official press conference on the discovery is expected in the near future.